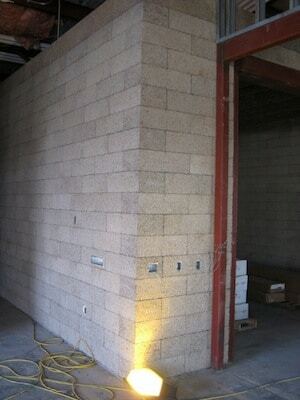 Faswall block is an excellent choice for wine cellar construction and wine production/storage facilities. This is due to the vapor permeability of the wood fiber/cement composite. Vapor permeability is a materials ability to allow water vapor to pass through. In a Faswall-built wall, the block can be left without being wrapped in a water-proof membrane. By leaving the wall vapor permeable and capable of taking in moisture and releasing moisture the wall system is in effect “breathable” — which is, of course, perfect for wine cellar construction. Since wood fiber cement composite has nothing in it that can “rot,” there is no capacity for mold growth occurring inside the wall system. The goal is to effectively stop any wind driven rain/snow etc. from migrating into the building. It is okay for the wall to take on moisture, as it is released in the push and pull of the high and low pressure differential between the interior and the exterior. Humidity and temperature fluctuations affect the quality of wine’s flavor and aroma. Relative humidity levels must be maintained at levels between 60 to 70%. Temperatures extremes are to be avoided. Faswall-built walls have the capacity to meet both of these requirements much more effectively and naturally than traditionally stick built structures, or other wall systems. This is why wine cellar designers love using it for wine cellar construction. RH levels in a Faswall building are kept low enough so that it is not possible to reach the level of RH where mold can start to grow (typically 70% RH). Combined with the high pH (alkaline) environment resulting from the cement content, this means that the wall system actually helps to inhibit mold growth. Last week I was viewing the South Seattle Community College Wine Academy. This building is being built by Regency NW Construction Inc., of Bellevue, WA. The facility was designed by Boxwood architects. They chose Faswall for their wine cellar construction material.